Water-Jel Burn Dressings provide fast, one-step relief for emergency first aid when someone has been burned. The dressing stops burn progression and cools the skin, relieves pain and protects against airborne contamination. 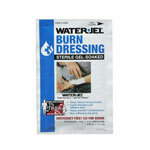 Water-Jel Burn Dressings are made with a scientifically formulated cooling gel and utilize medical-grade non-woven pads. They are non-adherent so they will not stick to burn injuries. The dressings are soaked in a water-based/water-soluble, bacteriostatic and biodegradable gel and sterilized to ensure a contamination-free atmosphere for emergency treatment of burns. With Water-Jel Burn Dressings, it takes no special training to give fast and effective emergency burn care for any type of burn injury. Water-Jel Burn Dressings have a long shelf life and are Sterile and foil-packed. The dressings have a Total Body Surface Area (TBSA) icon that indicates approximate total body surface area covered with the use of this dressings; Adults 1%, Children 2% for the 4" x 4" dressing, and Adults 5%, Children 20% for the 8" x 18" dressing. The 8" x 18" dressing is designed to cover larger areas such as the thigh, lower leg, back or shoulder. *This product is for available for sale to individual customers only - not available for groups or organizations.